The Descending Triangle usually signals a continuation pattern in an downtrend, but sometimes can be found at the top of an uptrend, signaling a reverse. This stock pattern has a flat lower trendline while the upper trendline slopes downwards. The completion of the formation occurs	when the price breaks through the lower, flat trendline before finishing the apex of the triangle. Trend: To qualify as a continuation pattern, a prior trend should exist. Ideally, the trend should be a couple months old. Bottom Flat Line: At least 2 lows are required to form the bottom horizontal line. The lows do not have to be exact, but they should be within reasonable proximity of each other. There should be some distance between the lows. Upper Descending Trend Line: At least two reaction highs are required to form the higher descending trend line. If a more recent reaction high is equal to or less than the previous reaction high, then the descending-triangle is not valid. 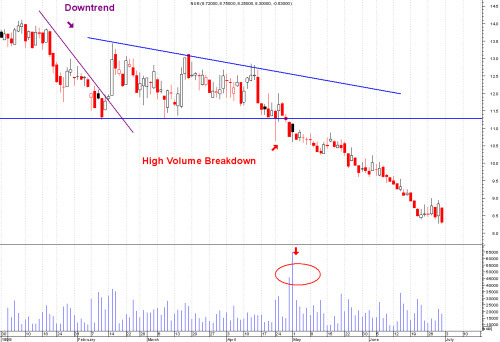 Volume and Breakout: As the pattern develops, volume usually contracts. When the downside breakout occurs, there should be a large expansion of volume to confirm the breakout. Pullback: Sometimes there will be a return to the support turned resistance level before the move re-starts. Price Target: Once the breakout has occurred, the price projection is found by measuring the widest distance of the pattern and applying it to the rsupport breakout. On the descending triangle, the horizontal line represents demand that prevents the security from moving past a certain level. It is as if a large buy order has been placed at this level and it is taking a number of weeks or months to execute, thus preventing the price from falling further. Even though the price cannot sink past this level, the reaction highs continue to shrink. It is these lower highs that indicate increased selling pressure and give the descending triangle its bearish bias. Return from "Descending-Triangle" to the Home Page: "Stock Market For Beginners"